You may have heard of Angkor Wat, but it’s far from the only temple in Cambodia. 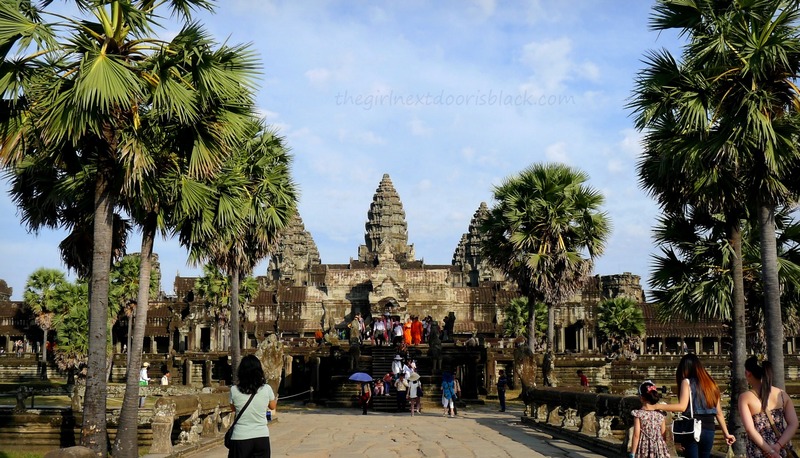 Located in Siem Reap, the famous monument shares the city with at least 1000 other ancient temples that also attract curious visitors from all over the world. I had the opportunity to explore four of these incredible feats of architecture on my recent trip to Southeast Asia and each is magnificent in its own way. Ta Prohm, constructed in the late 12th century, provided the backdrop for a scene in the film Lara Croft: Tomb Raider and it’s easy to see why. Towering trees border a wide dusty path and form a leafy canopy, providing sweet relief from the blistering heat. Once inside the complex, you’re surrounded by flourishing vegetation, piles of stone blocks, and more massive trees, some with roots so mighty they’ve scaled their way on and through the abandoned structures that still stand. Ta Prohm was once a Buddhist monastery and university. It took 80,000 workers to build it – according to a Sanskrit inscription found in the temple. There are 39 towers and over 500 former residences where 12,500 people lived across the nearly 650,000-ft2 property. This was pretty cool to see up close. 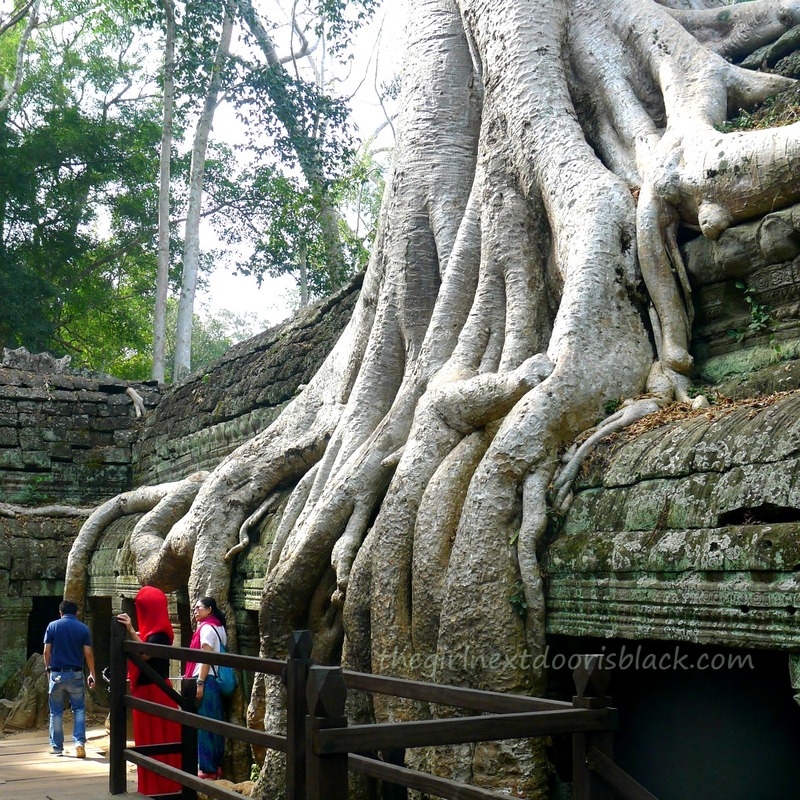 Ta Prohm has 39 towers and over 500 former residences. I bet Ta Prohm would be so much fun to see as a kid. 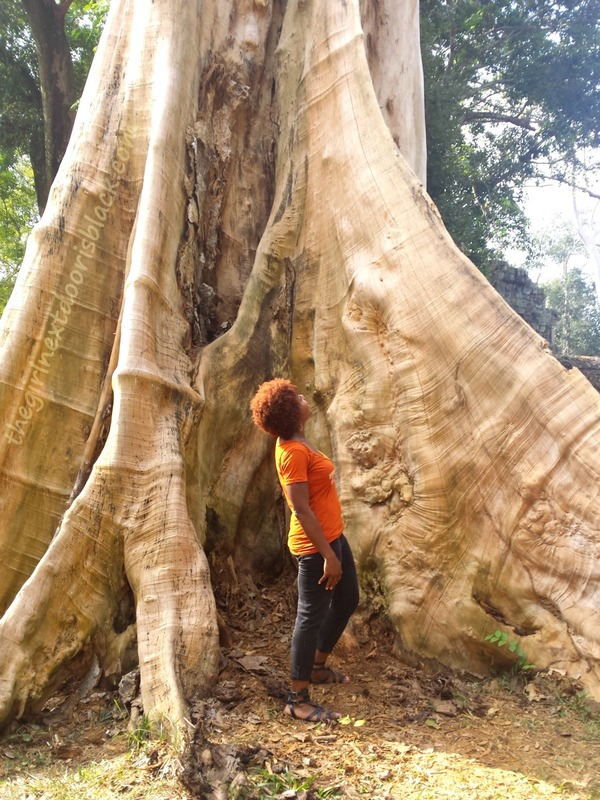 This is one gigantic tree. You could probably set up a person-nest in that trunk! 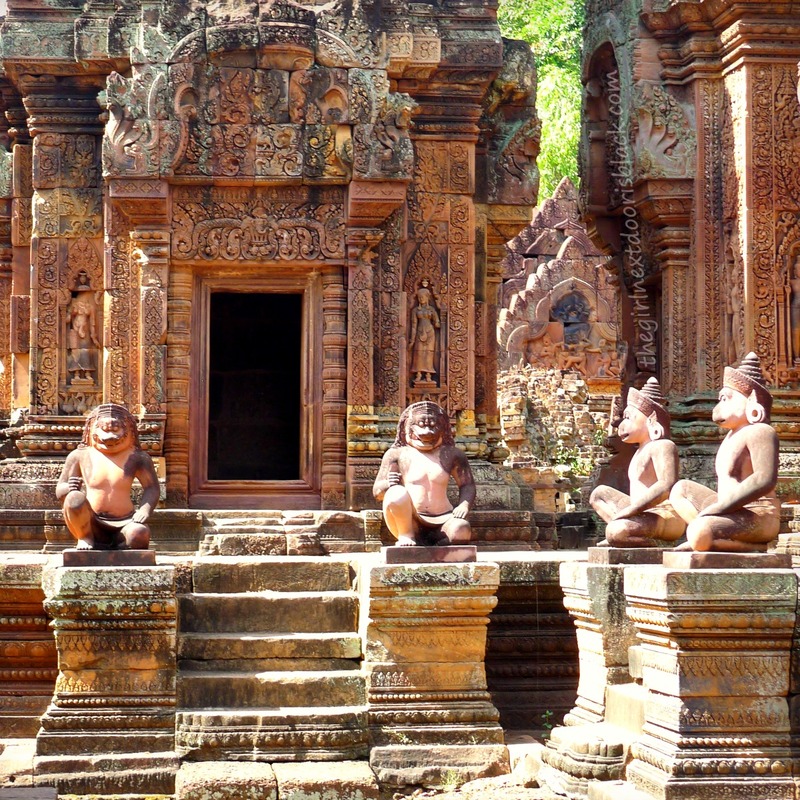 Banteay Srei is one of the smaller temple compounds, but it’s still quite impressive. It stands out among the other temples due to the pink sandstone used to build it, waaaay back in the mid-10th century. 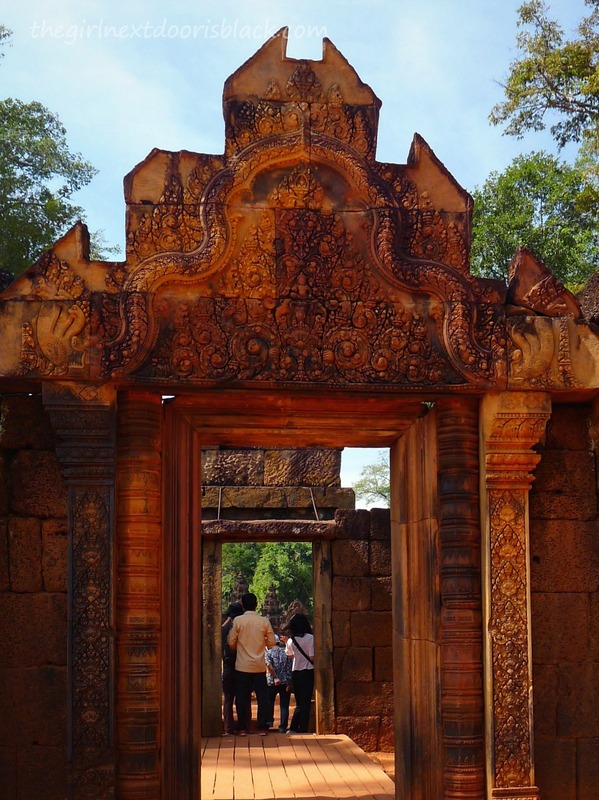 At the entrance to the small temple complex, you get a preview of the incredibly detailed carvings and sculptures Banteay Srei is known for. 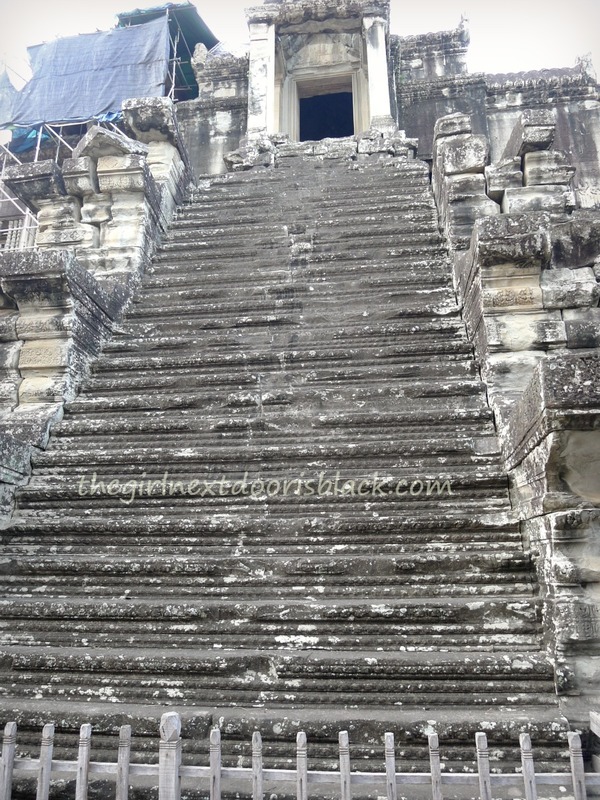 The carvings are especially impressive when you consider the rudimentary tools the Khmers (Cambodians) had access to. 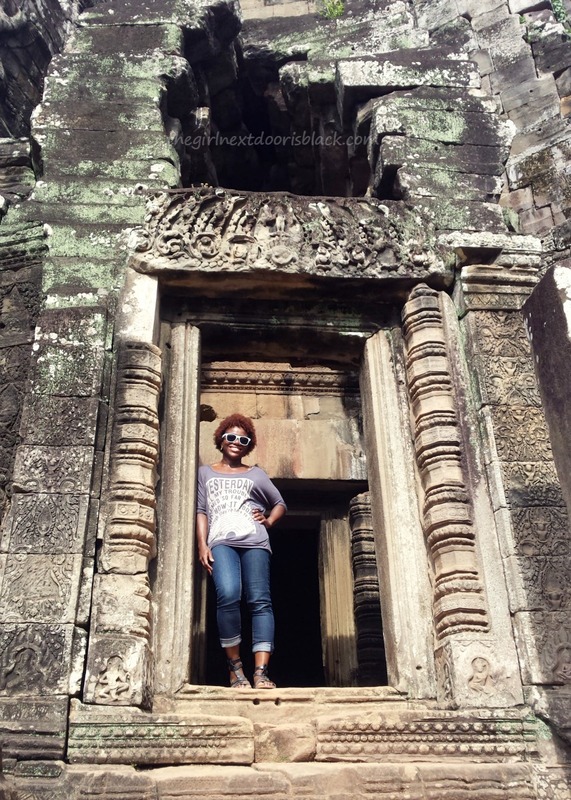 If the temples in Cambodia were a singing ensemble, Angkor Wat would be the Michael Jackson/Beyoncé/Tina Turner/Justin Timberlake/Sting of the group. It truly is stunning. 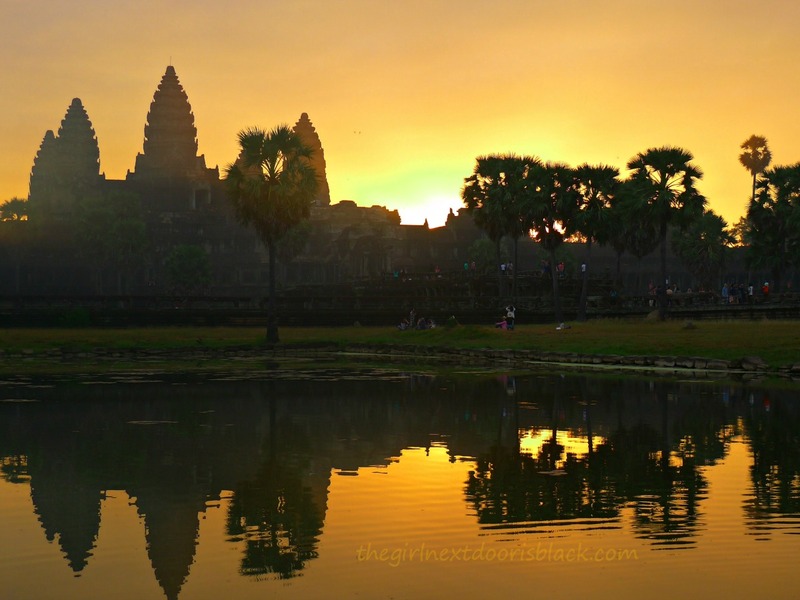 Angkor Wat (“Temple City”) – which dates back to the mid-12th century – rests atop about 500 acres of land, making it the world’s largest religious structure ever built. As with Banteay Srei, the fine detail of the elaborate carvings and motifs etched into the stone walls of the galleries are awe-inspiring. Imagine how much labor went into constructing such an incredible structure. Our group visited the temples twice, once in the afternoon, where so much sweat streamed down my face it led one of my tourmates to chuckle and ask: “Did you pour water over your head?” The second time, we got up earlier than anyone should ever have to, so that we could watch the sun rise over the towers. It was all totally worth it. Angker Wat’s five towers represent the five peaks of Mt. Meru of Hindu lore. You had to climb these super steep steps (say that 3 times in a row) to reach the top of the tallest tower and a great view. I hate heights so my heart was definitely doing jumping jacks on the ascent and descent. I wasn’t alone though, some chose to climb up using their hands and knees, and some scooted their way down the narrow stairs. These are the old stairs. Even scarier! 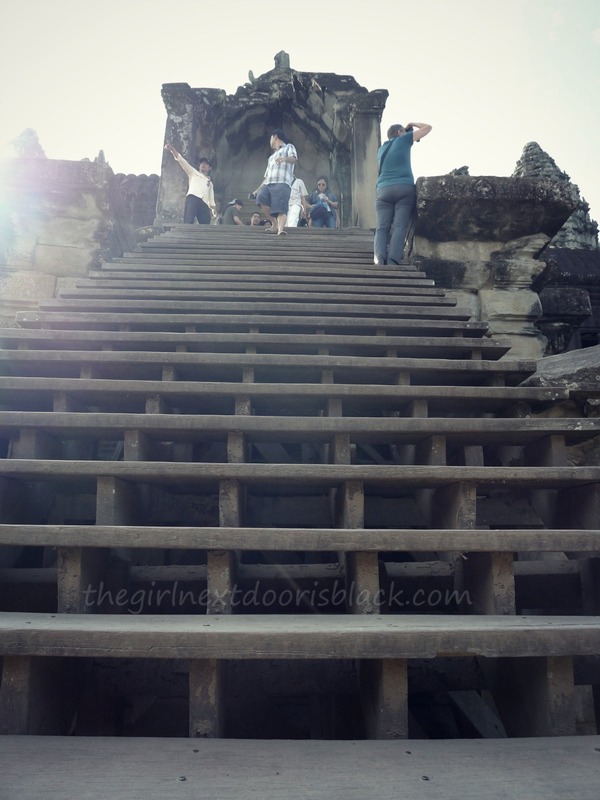 Watching the sun rise over Angkor Wat is clearly a popular activity. 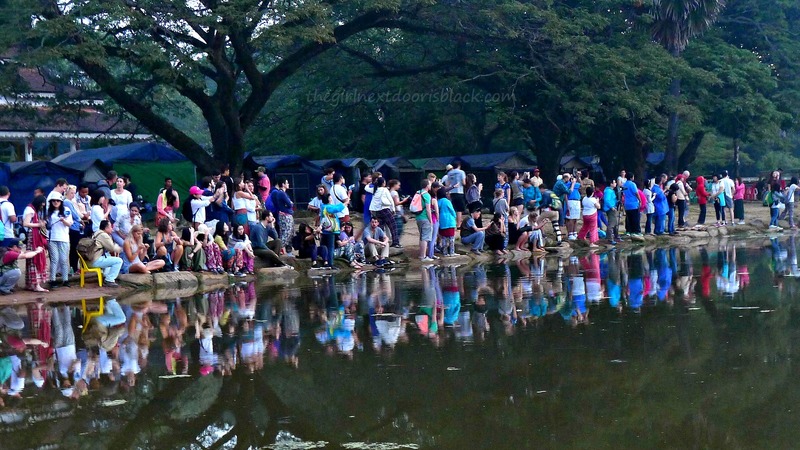 There must have been hundreds of people around the perimeter of the lake. 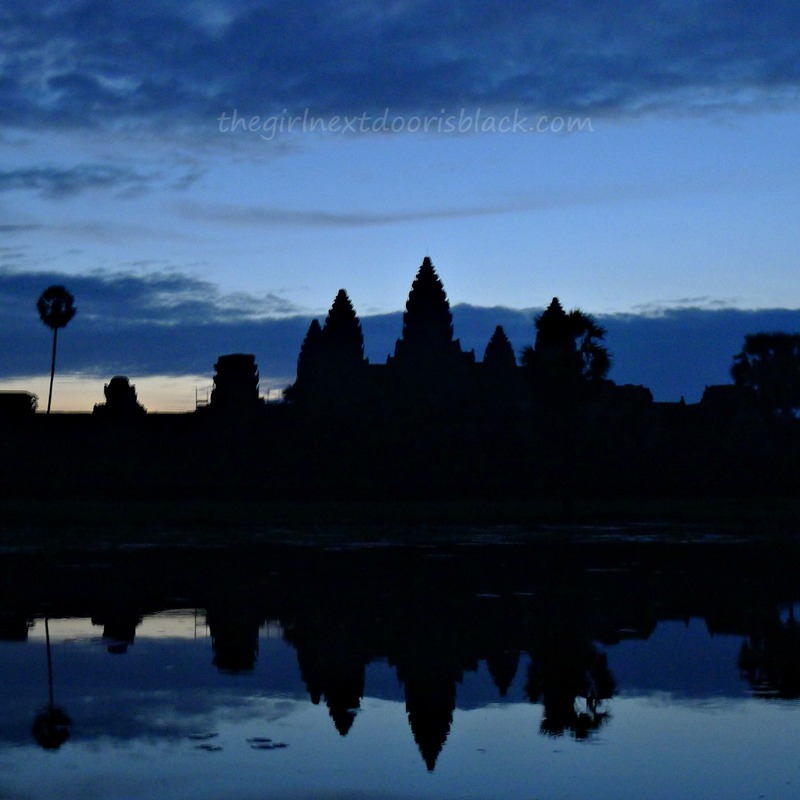 Seeing the sunrise over the temples of Angkor Wat was an almost surreal experience. On the way back to the van, after enjoying a pre-packed breakfast, a monkey accosted me. Bayon holds the title of most “theatrical,” or perhaps, the most “quirky” of the temples I toured. Even the entrance to the complex makes a statement. As you approach the south gate, to the left sit 54 gigantic heads of gods and to the right, a line of 54 demons. Not to be outdone, crowning the towers of the iconic, 75-ft tall, arched entryway are four faces of the bodhisattva, each looking out in all four cardinal directions. 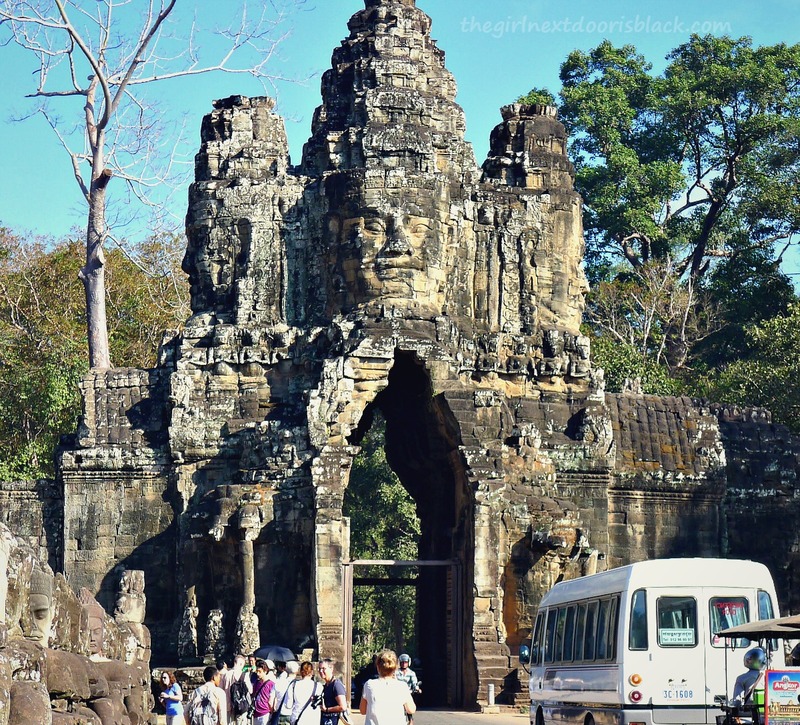 Beyond the gates lies the “city” of Angkor Thom (“Big Temple”) – once the capital of King Jayavarman VII’s empire – fortified by a massive 328-ft wide moat which surrounds a 26-ft high laterite wall that protects 360 acres, including Bayon temple. Neighborhood watch on 100. Everywhere you turn in the Bayon complex, there are eyes watching. Over 200 faces etched into stone cap the 54 towers at the site. While the identity of the figures decorating the temple is unknown, some speculate they are likenesses of King Jayavarman VII and a reflection of his inflated ego. 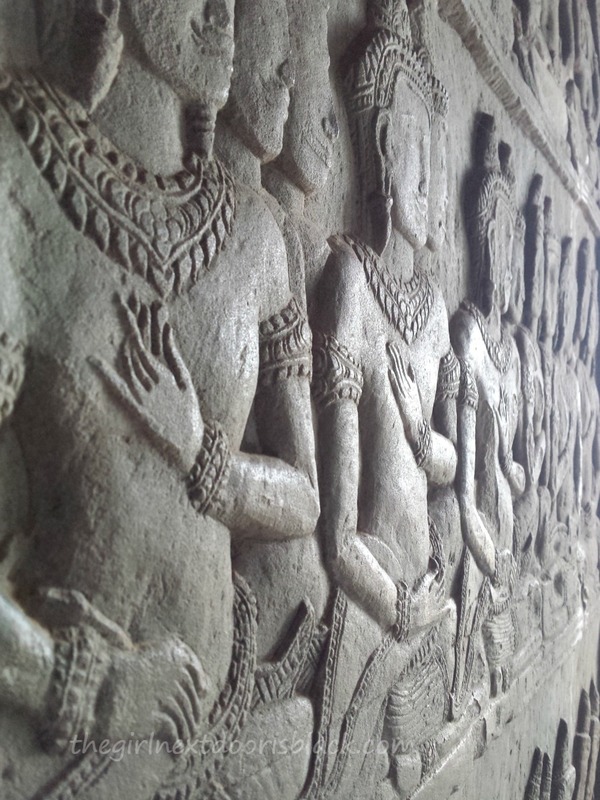 The mysterious expressions on the stone faces has led some to dub them the “Mona Lisa of Southeast Asia”. Beautiful, intricate motifs cover the walls of two galleries that surround Bayon’s main temple. The bas-relief carvings reflect the daily lives of the Khmers in the 12th century, as well as tales based in Hindu mythology. 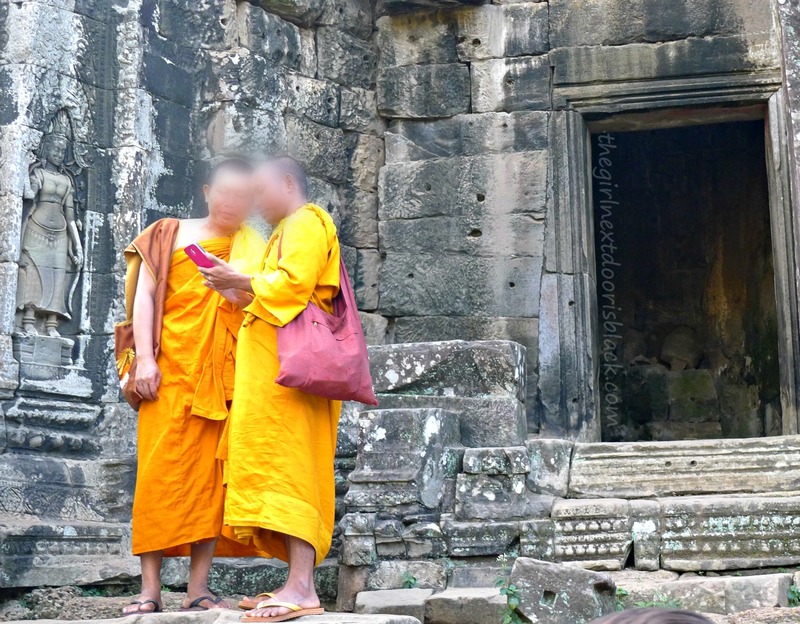 Two monks review the photos they took on a smartphone. It is considered respectful to cover your shoulders and knees while at a temple. With my tourmates. Including me there were 3 Americans, 1 Brit, 1 Swiss, and 1 Aussie in our group. Can you guess who’s from where? Like what you read? 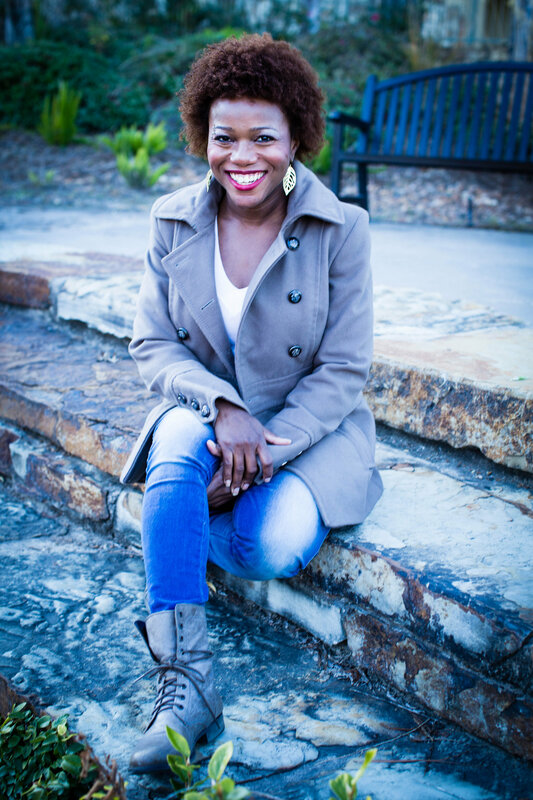 Follow The Girl Next Door is Black on Twitter, Facebook or subscribe. And I hope to visit Egypt one day! How incredible it must have been to see the Luxor (and not in Las Vegas)! Yes, I do hope you get to visit Cambodia; it’s a lovely country! Beautiful pictures, Lovely Blog. Hope to visit the temples some day! Thanks for your comment, PriVin! Thank you for dropping by, Urska! Cambodia is one of the more unique places I’ve gotten a chance to visit. It’s a wonderful place and I have so much respect for the Cambodian people. 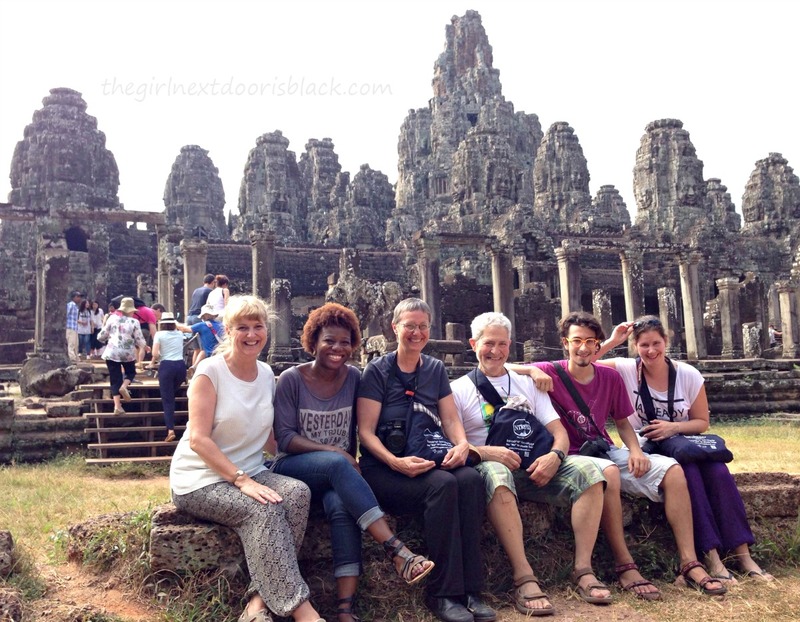 I do hope you get to visit one day and see the beauty beyond Siem Reap! I’m so glad I got myself out of bed to catch the sunrise, it was so worth it! Thanks for your comment, Marcella! Wow, that Uluru experience sounds amazing. I am hoping to make it to Australia this year and I’ll have to put that on my list! I skipped the sunrise. Ain’t nobody getting me up at 4:30am!!!! Nice photos! Lol, it was soooo early. Thank you! I love the pictures! They’re absolutely beautiful! What an experience. Thanks! It truly was unforgettable! The sunrise was a unique experience. Nothing like being surrounded by hundreds of people from all over the world, speaking different languages, and all in awe. Thanks for your comment, Roberta! One of the thoughts that kept running through my head at these temples was how many people must have walked the same grounds over hundreds and thousands of years. Reading your mom’s (lovely) words and seeing her (wonderful) photos – which look so similar to mine – is a reminder of how much bigger than us the world is. But the end of the post, wow, I can’t even imagine. What a time it must have been to visit Southeast Asia.